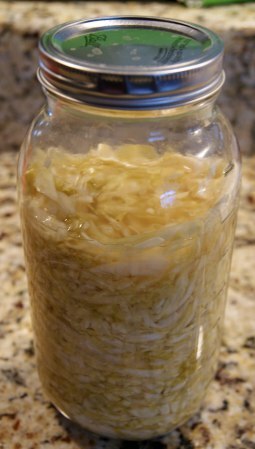 Never made sauerkraut before, but it seemed pretty easy and good, so I did. It really is easy, and it’s a pretty flexible process. I’ve seen lots of ‘recipes’ that have a standard measure (3 Tbsp salt for every five pounds of cabbage, or something like that? ), but I used the method from Wild Fermentation, which is not at all precise. It involves shredding the cabbage first (well, they all do, don’t they? ), which can be done with a knife (harder), a mandoline (I had to quarter the cabbage first, but it worked well), or an actual cabbage slice, which is, in essence, a giant mandoline. Layer the cabbage in your (clean) vessel of choice – I used glass half-gallon jars, but eventually I’ll probably get a two- or three-gallon crock – and after about every inch or so, sprinkle some salt in. I also smashed it up a bit to get some juices flowing. 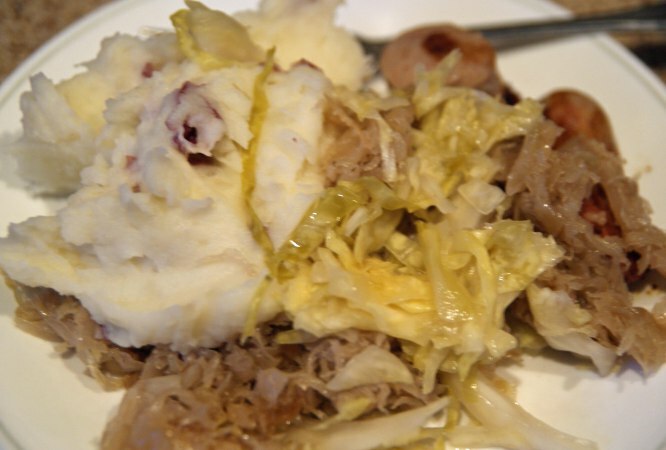 Keep layering and sprinkling, until you’re out of cabbage or about 3/4 full. 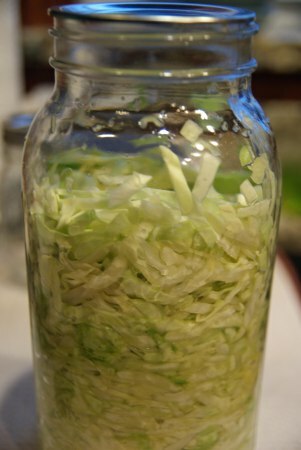 Let it sit overnight to allow the salt some time to extract water from the cabbage – what you’re shooting for is enough brine to cover everything in the jar by a bit. If you don’t have enough, mix up a little salt water (1 Tbsp per quart) and pour over the top. At this point, you’re supposed to cover it, so everything stays submerged (it will have a tendency to float, and any exposure to air can lead to mold). I’ve seen recommendations ranging from a plate to a bag filled with brine to weigh everything down; I just used a couple extra cabbage leaves. You really don’t even have to do this, if you don’t mind scraping off the mold from the top each time you eat it. The rest is just waiting, for at least several weeks. I didn’t touch mine for over a month. Keep it in a basement, or a coolish area. The great part is that the fermenting process also preserves it (lactic acid and whatnot), and I still have a couple jars sitting out in the cold garage. I won’t be keeping them in the garage in the summer, but while it’s cool, it works great. I pulled it out for the traditional New Year’s dinner – I can’t tell if I’ve had better fortune this year than year’s past, but the food is still good!